Has anyone tried to log into the app yet? It doesn’t seem to find my log in info. I’m wondering if anyone is having the same problem. I really don’t want to have to search through all of the stuff on mobile again. Did it email you a verification code? Once I entered the verification code, it synced my schedule. It said it couldn’t find my e-mail. But only on the app. The web version works fine. Is it saying your email couldn’t be found after entering your first and last name? After logging into your account in web version, have you checked under My account -> Account Settings to see if everything looks good there? yup. Looks good there .Everything I am doing on the app matches what’s in there. Am I missing something with the app schedule? The “My Schedule” section only shows the stuff I clicked “Schedule” on, but it does not display all of the stuff I marked as “Interested”. I need to double book time because so often there’s so many offerings that I end up deciding in the moment which one to go to. I can’t see that through the app this time. 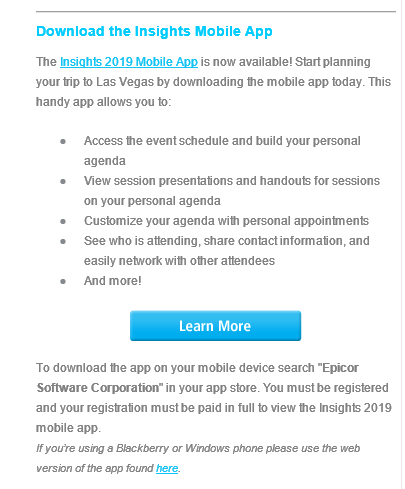 So I contacted Epicor from the website, since I can’t find any other way to get into contact with someone that would fix this (not being able to log in on the mobile app), and they want to refer me to Epiccare… @aidacra Service isn’t going to handle the mobile app for insights is it? EPICOR I know it’s a gripe every single year at insights, but can someone PLEASE make your registering process easier. What you have in place is horrible, and every year it’s a different kind of horrible. For a software company to allow such a bad user experience is incredibly frustrating. Insights App - Download it now! For a software company to allow such a bad user experience is incredibly frustrating. thought this in particular was funny to see! Excited to see where Kinetic framework is going at Insights this year! So am I seeing this right, you can’t even see the general schedule from the app? You have to go to the desktop version to see the schedule? Then what’s the point of the app?